World champions Sherry Cevi, left, and Chad Ferley, center, wait with Carr pickup man Jeremy Hight prior to the opening in Guymon. 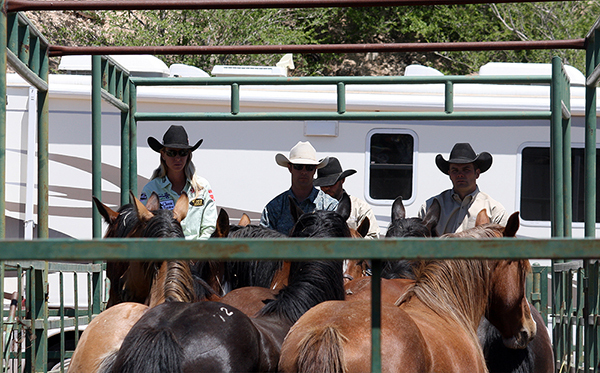 Production is a big part of the experience at a Carr rodeo. SILVER CITY, N.M. – Rodeo is much more than bucking animals and fast horses. Rodeo is a lifestyle, and every event offers something quite spectacular. For contestants, it’s a way to compete and make a living; for volunteers, it’s about creating an annual happening for the community. For fans, a rodeo is great family entertainment filled with amazing athletic feats and explosive action. That’s why the crew from Pete Carr’s Classic Pro Rodeo and Carr Pro Rodeo take their jobs so seriously when it comes to event production. It’s why they’re excited to be part of the Wild, Wild West Pro Rodeo, set for 8 p.m. Thursday, June 6-Saturday, June 8, at Southwest Horseman’s Park. There also will be a special section of bull riding set for 8 p.m. Wednesday, June 5. Like every other event on the scheduled for 2013, production is the key. It was that kind of showcase that drew members of the Will Rogers Stampede committee to hire the Carr crews for the 2013 rodeo in Claremore, Okla.
“It was the professionalism, the production,” Petty said. “It was a well-oiled machine. The value of the Carr production machine works quite well at rodeos of all size. In all, Carr Pro Rodeo and Pete Carr’s Classic Pro Rodeo will produce 33 events this year. Fans have taken notice, but so have the cowboys who make their livings on the backs of the greatest bucking animals in the game.